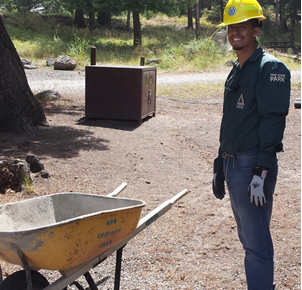 This summer, Groundwork USA sent Green Team youth from around the network for a week-long trip to Yellowstone National Park to work, learn and live. While in the backcountry of America, the youth learned new skills that they can bring to their Groundwork projects back home, gained more knowledge about themselves and how they work, and a greater appreciation for nature. Building a stone wall was one of the major projects that they worked on. In addition, the Green Team students were able to talk to park rangers and YCC staff about their roles within the Park Service and to talk about career ideas. Read more about Yellowstone through the eyes of three youth from Groundwork Jacksonville, Groundwork Portland and Groundwork Richmond.